(Nanowerk News) In the 18 months since the disaster at the Fukushima Daiichi nuclear power plant following an earthquake and tsunami, as Japan's other nuclear reactors shut for routine maintenance, popular opposition kept them from restarting. The country entered the summer of 2012 with all its nuclear generators shuttered. With a fourth of its pre-Fukushima power supply gone, blackouts were expected, especially in the country's western region. Surprisingly, that did not happen. The electric utilities got through the air-conditioning season primarily because consumers sacrificed their comfort, but luck also played a role, according to Toshiya Okamura, an executive with Tokyo Gas Company and a visiting scholar at Stanford University's Precourt Energy Efficiency Center. 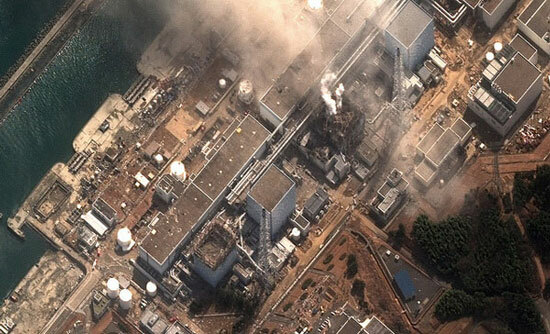 Satellite image of damage at the Fukushima Daiichi Nuclear Power Plant in Japan following the March 11, 2011, earthquake and tsunami. A Tokyo utility executive is visiting Stanford to figure out how Japan can thrive on less electricity. "People did everything they could," said Okamura. "To minimize air conditioning, they raised thermostats in homes, offices and stores to 83 degrees Fahrenheit, as the government asked. They set every appliance and electronic device to the most energy-efficient settings. They kept the lights off as much as possible. Escalators were shut off." It worked. While government forecasters expected voluntary reductions in consumption to shave peak demand by about 6 percent, in fact, residents and businesses cut about 11 percent, according to government analysis. "There was some pure luck, too," said Okamura, whose permanent position is running Tokyo Gas' renewable energy and energy efficiency programs. "Western Japan had very heavy rains in May and June, which gave us extra hydropower all summer. Also, at any given time you expect about 5 percent to 8 percent of your fossil-fired generators to not be working because of some mechanical problem. On the hottest day for Osaka, that region had zero generators off line. And for the country overall this summer, very few generators were out of service." In July, a governor in the western region, which includes Osaka and Kyoto, approved the restarting of two nuclear reactors despite popular opposition. The debate was so intense, however, that no other governor has been willing to review further restarts. In the Tokyo area, where summer supply shortages hit in 2011, the Fukushima operator – Tokyo Electric Power Company – ramped up fossil fuel-fired output to help overcome the nuclear shutout. Other electric utilities have yet to secure alternatives to nuclear power. Okamura remains deeply concerned about Japan's energy future. In a country where space heating is often supplied by electricity, this winter will be the next big test, especially for the northern city of Sapporo. The government assumes that continued voluntary energy savings will be significant through 2030. But Okamura sees that assumption as unbelievable. "Thermostats set to 83 degrees? This isn't energy efficiency. It's just pushing people to suffer," he said. "One thing I've learned here is that energy efficiency is about reducing waste – that is, producing more and enjoying the same amenities with lower energy inputs." "But the government is saying that these voluntary savings will persist. I don't agree," Okamura said. In fact, he pointed out, Tokyo-area electricity savings dropped to about 10 percent in the summer of 2012 from 15 percent in the summer of 2011, showing how quickly voluntary programs can lose steam. California's electricity crisis of 2000-2001 saw a similar pattern for the effectiveness of voluntary appeals. The government's assumption that voluntary cutbacks will persist is based on a survey of 20,000 residents and businesses, asking if they suffered from the sacrifices, and if they could continue the same practices next summer. "This is like some paper written by a high school summer student. I can't believe the government's national energy policy is developed partly based on this," said Okamura. Immediately following the Fukushima disaster, Japan's Ministry of Economy, Trade and Industry (METI) said that all Japan's homes would get "smart meters" for electricity and, later, for natural gas. A smart meter is an electronic reader that allows two-way communication between the meter and the central system. Okamura questioned the idea, which could cost about $10 billion. He knew that the U.S. experience with smart meters, from a cost-benefit analysis, has not been very encouraging so far. Japanese industry is already energy efficient, thanks to a mandate dating back to the oil crisis of the 1970s, so cuts to make up for the lack of nuclear supply need to come from commercial customers and residents, Okamura said. The government of the region around Tokyo – the world's largest urban area – turned to Tokyo Gas for help because Tokyo Electric's resources continue to be completely consumed by the effects of Fukushima. It was decided that Okamura should spend a year at Stanford learning about the technology, policy and behavioral understanding of energy efficiency. "The United States and Europe are still learning how to do this, especially regarding behavior change, but you are 10 to 20 years ahead of us on this," Okamura explained. Since he arrived in April, the utility executive has studied how to establish efficiency programs on sound research and cost-effectiveness analysis, and then to verify and assess outcomes. When he returns to Japan in the spring, Okamura will be able to tell METI what would be necessary to achieve its energy savings goal of 20 percent in the years ahead, especially as the effectiveness of voluntary pleas wears off. "My job is not to say we can't get to 20 percent. My job is to tell them what we have to do to achieve that," Okamura said. "They will say themselves that 20 percent is not achievable." He expects that with financial incentives, funding for retrofits and other measures, homes and smaller businesses could reduce electricity usage 10 percent, and maybe even 15 percent. METI has been trying to develop a new energy plan since 2011. Frustration with the process and the general handling of the disaster led to the Democratic Party of Japan losing control of the government in December. Nuclear policy remains the center of the energy debate, specifically whether to go to zero nuclear power, return to 25 percent by 2030 or target some level in between. "I think METI and the Cabinet miss the point," said Okamura. "It's not about the best energy balance or which nuclear plants should be restarted. While many people oppose nuclear power, the industrial and commercial sectors are facing serious rate increases due to more gas- and oil-fired generation. Industry wants cheaper electricity. Some may want green electricity, some want nuclear-free electricity and others want cheap electricity. We need energy choices." "Eventually some nuclear reactors must come back," he said. "But people have become completely afraid. Nobody eats any food produced within 200 miles of Fukushima. Parents in that area, which includes the largest cities, have to bring their children in every year to measure their cumulative exposure. They will never forget this." Stanford will continue to play a role in Japan's energy challenges. Tokyo Gas, a member of the university's Energy and Environment Affiliates Program, will send another executive to continue Okamura's research at the Precourt Energy Efficiency Center in April.